“Twelve-year-old Evie’s mother has died, giving custody of Evie to an uncle she barely knows in New York City. Evie is loathe to leave her home in Dublin, so she and Uncle Scott strike a bargain that Evie will spend the summer in New York and then decide if she wants to stay or return to Ireland to live with her godmother. This hook, along with a prologue that finds Evie stuck in a building’s trash chute after escaping a security guard, lend structure to an otherwise delightfully anecdotal plot that shifts between Evie’s adjustment to Manhattan (including her helping out at her uncle’s veterinary practice and her crush on an older boy) and flashbacks to her life in Ireland. “Although it opens with yet another dead mother, Evie Brooks Is Maroonedin Manhattan is a fresh take on the duck out of water trope. Evie finds herself living in Manhattan with her uncle, a veterinarian—about as far from her late mother’s bohemian life in Dublin as Evie can imagine. After a few funky days, Evie starts lending a hand with the animals, making friends, discovering the city, plotting against Uncle Scott’s scheming girlfriend, and learning how to cope with grief that sometimes leaves her breathless and afraid. This is a quick-moving novel, and Evie is by turns smart, cheeky, stubborn, and introspective—a highly identifiable and likeable lead character, even when the characters who surround her are somewhat less rounded. 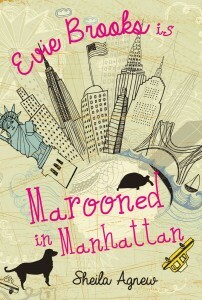 “Evie Brooks is Marooned in Manhattan, by Sheila Agnew, is the story of a 12-year-old girl living in Ireland who is orphaned when her mother dies (her father having been out of the picture for many years) and who reluctantly agrees to spend the summer with her uncle, Scott, as long as she can return to Ireland in the fall to live with her godmother. “…On the whole, I found Evie engaging and solidly voiced, while she worked through her grief she did find many intriguing and new things, and animals galore—from exotic (Iguanas and snapping turtles) to ordinary dogs and cats. Well developed, you can see the city through Evie’s fresh eyes, and understand her needing to keep busy as she deals with her grief. Adults are also more than just window dressing, her relationship with Scott and the conflicts with Leela feel honest and are well-spaced: not too much acting out or angst. The showdown at the end, combined with Evie’s own guilt over some situations with Scott bring her to the cliffhanger… will she stay in New York, or return to Dublin.